Scouring the available market for an industrial gas supplier for your business can feel like an uphill battle. Running your organization effectively means keeping a steady eye on cost as well as quality. You can you get both of these key components as long as you know what to look for when screening potential suppliers during the selection process. First and foremost, you will want to determine that a potential supplier has access to the types of gas that your organization will require. Ask about their overall selection and variety; teaming with a firm that offers a wide range of resources will mean that they not only have what your business needs now, they will also have the right reserves to grow right along with your business as your requirements evolve. Most importantly, ask about the grade variety offered by the firm so you have the peace of mind that comes from knowing you are purchasing high-quality product. You will always want to ensure that your chosen supplier is a fully authorized distributor for any line of gas that your business will use. With so many fly-by-night organizations opening and closing in the industry, having an established facility is another major factor you will want to look for. Ask to make an appointment at their showroom to get an up close look at how the organization operates, as well as their overall corporate culture and vibe to determine if it will be a good fit for your business. A well-established organization does very little good for your business if they cannot get your order to you. Ask about a prospective suppliers fleet of delivery vehicles, delivery schedule and flexibility, as well as their delivery area, so you know your shipment will arrive on time as needed. Some businesses prefer buying their gas cylinders, and others would rather rent the units. Do not box yourself in to just one method with your industrial gases suppliers. Look for a firm that offers both options so you can do whatever makes the most sense. Finally, look for a firm that focuses on customer care and attention as a top priority. Do you really want to be just another name on a long list of anonymous customers? If not, then consider working with a smaller operation that has the resources and willingness to devote to personal attention and your satisfaction. Are you looking for a top quality industrial gases supplier? 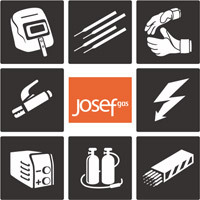 Contact Josef Gas today for more information or ask for an online quote now!